Two New Rain Gardens in the ‘Shed! Rain gardens help protect our water ways from harmful pollution found in runoff - including bacteria, nitrogen, phosphorus, and sediment. Volunteers have fun deciding where to plant perennials in their garden. 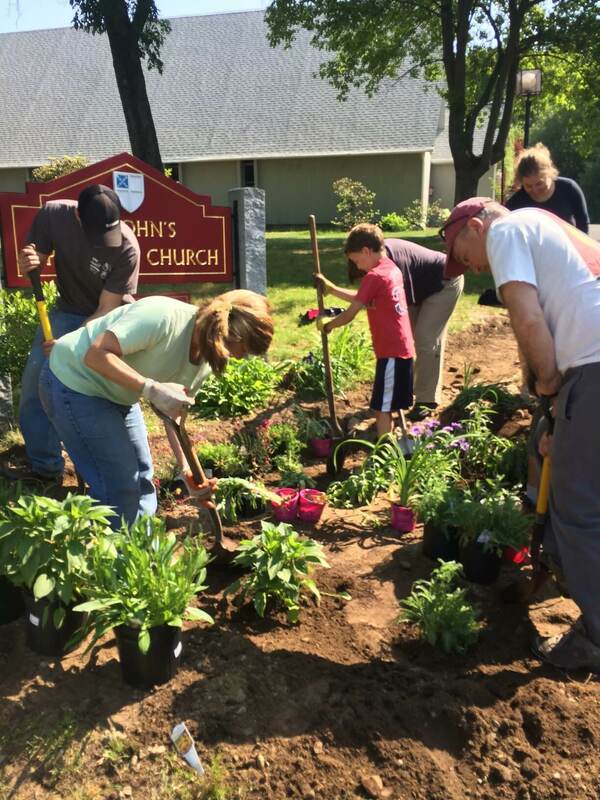 On May 30, a group of dedicated volunteers from the St. John’s Episcopal Church in Westwood constructed one of the watershed’s newest rain gardens. The garden is designed to take runoff from the church’s paved driveway and infiltrate it into the ground, preventing the runoff from reaching the street where it could carry pollution into our waterways through storm drains. Over the course of a year this garden should capture and treat about 14,000 gallons of runoff! Reducing runoff is a great way to help improve water quality, since runoff is the largest source of pollution for local waterways. Rain gardens use natural processes of soil and plants to capture the runoff and treat it before it causes any water pollution problems. Photos before and after rain garden installation at St. John’s. 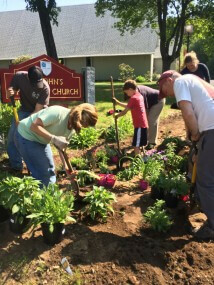 Rain gardens are built lower than the ground around them to provide space for runoff to filter into the ground and provide moisture for plants. 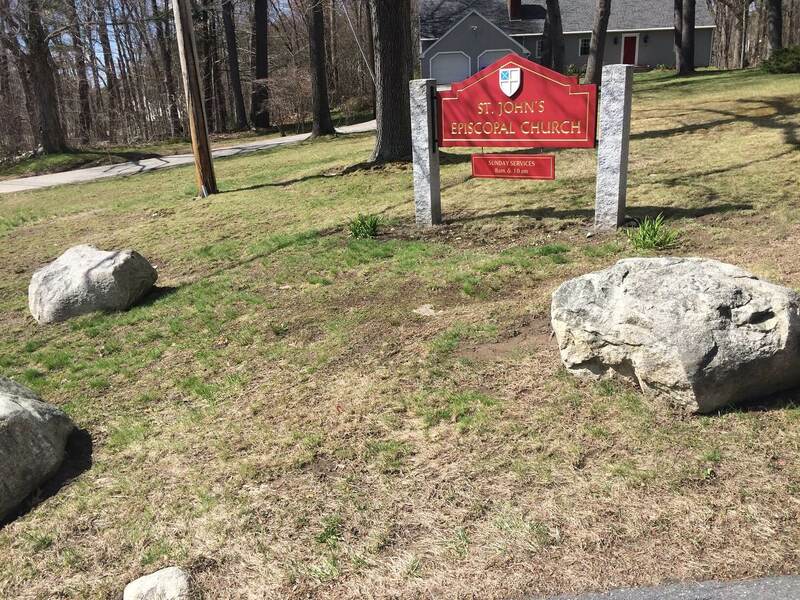 The best plants for a rain garden are perennials native to the area – some we selected for this garden are Black Eyed Susans, New England Asters, Winterberry, and Phlox. A few days later, on June 4, another rain garden was constructed at Xaverian Brothers High School on Clapboardtree Street. 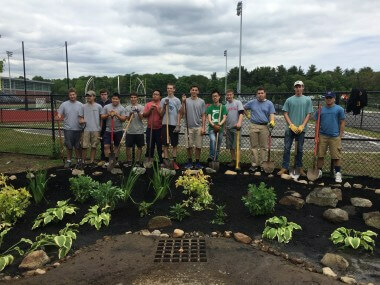 This garden was designed this spring with the help of a senior Environmental Science, and more than 20 students, faculty, and staff showed up (on the first day of summer vacation!) to help build it. 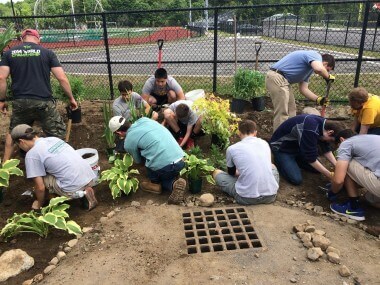 Read more (and see more photos) about the Xaverian garden here. Students working hard on planting their rain garden. At Xaverian Brothers the garden was built to capture about 15,000 gallons of runoff from a front parking lot, and prevent it from reaching Purgatory Brook which is just behind the school’s property. Both of these rain gardens were completed as part of the current “Soak up the Rain” campaign in Westwood, which is wrapping up this month. 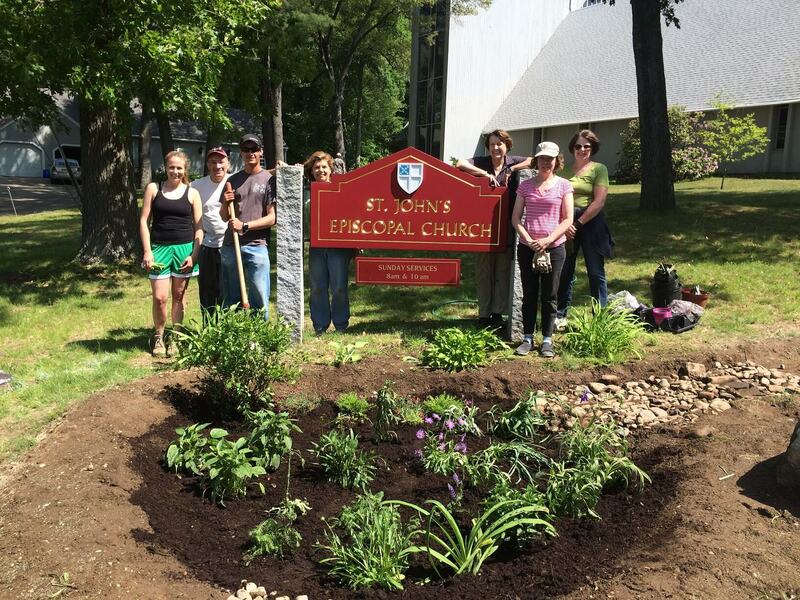 To learn more about the project (including resources on building your own rain garden!) visit the project web page.